*raises hand* I am an Ambien virgin, although when my mom was on it we had some umm lovely hallucinations. Like the day she was grabbing at thin air and telling me and a friend to 'catch them'. We were looking around saying "Catch what?" She finally replied , " The damn chickens it is time for me to comb their tailfeathers and they are running from me" .. Ummmm yeah only in Hicksville would THAT be an Ambien induced Hallucination. I am quite sure in my neck of the woods the shopping would be from places like Southern States and Tractor Warehouse. Angel, I remember trying to catch light rays....I'm a blonde, old, dork! sounds like 'shrooms though...but less natural. I'm an Ambien virgin as well. The one time I ate a pot brownie...i ate the whole thing and an hour later started fearing that i was going to have a psychotic break because I was way too relaxed. Everything was moving super slow. Sean had to keep calming me down. I was scared that I would wake up in a dream. I have no experience with Ambien and now that I hear everyones stories, I will NOT be taking Ambien! Only you could make a sweet fanciful tale of an Ambien Virgin work. I'm an ambien virgin! But hoping to get a low dose soon. I do believe I know yet another ambien virgin. 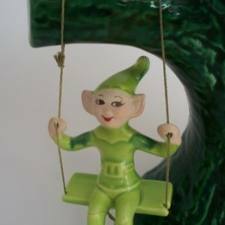 Although I'm thinking...swinging elves sound like fun, perhaps the virgin should get a little loose. Bad, bad elf. Never mess with a Diva on Ambien! When will they ever learn? Ambien virgin...that's me. I'm a warm milk with a sprinkle of cinnamon type of guy. Used to throw in a fifth of scotch, but don't do that anymore. I've never seen elves but there are ghosts cuz my house is over 110 years old and so...you just go have fun darling! OMG! I was just reading your responses and the word dork....that is what my daughter calls me and I wore a black t-shirt with the word DORK written in big red letters on the front. Cool Beans.